"That summer, as a follow-up to the conversation, I called Shane and asked him, 'Shane, this morning while you were shaving, did you look in the mirror and imagine that you were looking at next year's conference player of the year?' He chuckled and began to respond, 'Coach, c'mon, I didn't...' Click, I hung up the phone. 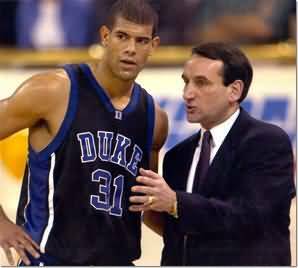 The next day, I called him again and this time asked, 'When you were on your way to your internship this morning, did you picture yourself going for 30 points against Virginia?' Again, Shane responded with a cautious laugh. I hung up on him again. A few seconds later, my phone rang and it was Shane. 'Coach, don't hang up on me!'... 'I won't hang up on you if you won't hang up on you.' We made a deal that he would imagine those things. Shane needed to imagine because, by doing so, when the time came and he actually found himself in those situations, he would feel as if he had already been there." As a basketball coach, you can remind your players to "not hang up on themselves" by encouraging and instructing them to visualize and mentally rehearse how they want to play the game. The impact of your players' performances in a game can be defined by the intensity of their mental imagery before the game begins. Given the physical and emotional demands of a basketball game, it is important that you help your players mentally condition themselves and prepare their minds to perform on the court. It's using all of their senses, including self-talk, in order to develop a what is called "full impact imagery". Instruct your players to close their eyes, take a deep breath, and begin to take themselves through one particular play or game-time situation. In their minds, they will slowly take themselves through each move and step that they are making from the beginning to the end. It is using all of your senses to develop a complete mental picture of your performance on the court. See how you are positioned. Feel the floor below your feet. See yourself making the first and second moves on the court. Feel the sense of accomplishment as you successfully execute your role during the play. Listen to yourself as you talk to yourself through the series of moves.